Intergalactic Justice Book II: Maximum Velocity! Intergalactic Justice Book II: Maximum Velocity is now available in print format at New Concepts Publishing! Join Samantha on her second daring adventure in my futuristic paranormal series! Dark forces conspire against Samantha Cassidy and her family. With her niece taken by a ruthless Intergalactic Triad, Samantha must ally with a powerful man who was once her enemy and in doing so...she just might lose herself. 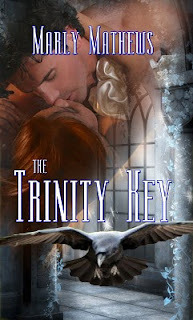 The Trinity Key By Marly Mathews! The Trinity Key has released at New Concepts Publishing! 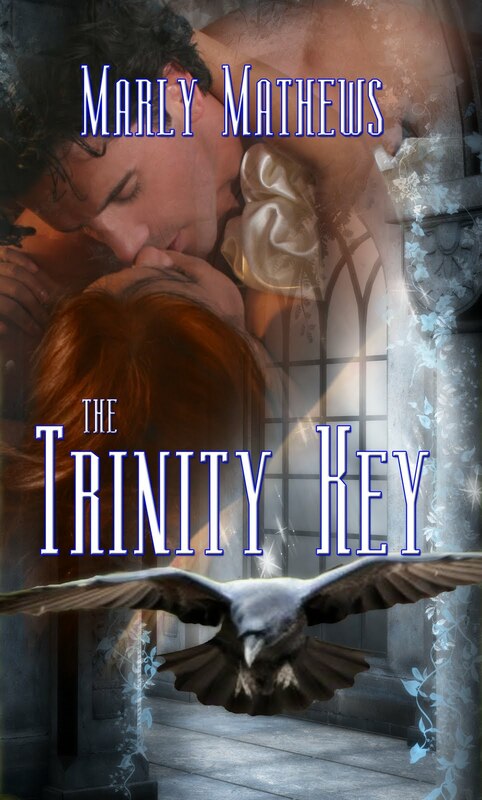 The Trinity Key is a futuristic inter-dimensional romance! The Trinity Key By Marly Mathews Available Now at New Concepts Publishing! She stole his heart. He gave her back the world she'd lost. Natalie Martin is a psychic and a professional thief. She and her partner in crime jump from dimension to dimension in search of ancient artifacts with immeasurable power. Once in possession of these artifacts they jump back to their home dimension where their government sells the artifacts on the Intergalactic Black Market. When a jump back home goes terribly awry, Natalie finds herself in a foreign dimension where nothing is what she expected, and where she finds that fate has given her a second chance with the love of her life, Tristan Wessex. Now all they have to do is save Tristan's dimension from a madman empowered with The Elemental Box, an Ancient Celtic Box so powerful that it can give or take away life. Hey Everyone! Maximum Velocity has released at New Concepts Publishing! 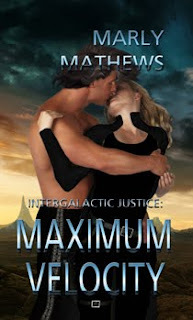 This is the second book in my Intergalactic Justice Series! Dark forces conspire against Samantha Cassidy and her family. With her niece taken by a ruthless Intergalactic Triad, Samantha must ally with a powerful man who was once her enemy and in doing so... she just might lose herself. I have made a book video for Reckless Bounty! Enjoy! New Release: Reckless Bounty by Marly Mathews! Reckless Bounty has been released at New Concepts Publishing!!! 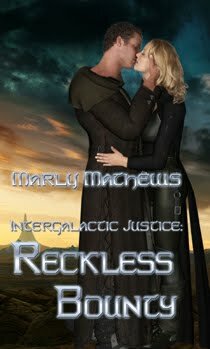 Reckless Bounty is the first book in my Intergalactic Justice Series. This is a futuristic paranormal series revolving around the heroine's adventures as a bounty hunter and as a woman with several psychic abilities. Samantha Cassidy has her own unique sense of justice as an intergalactic bounty hunter. She's a psychic in denial with powers that sometimes have a way of emerging without her permission. When she learns that her estranged husband is about to hang for a crime she is convinced he didn't commit she races to save him before it's too late. Buy Reckless Bounty by Marly Mathews! 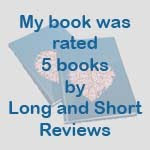 FIVE BOOK REVIEW FOR LADY PENDRAGON FROM LASR! Lady Pendragon was awarded 5 BOOKS by Orchid over at LASR!!!!! Thank you, Orchid! Below is a her review with the link back to LASR! Molly Pendleton is 1500 years old, but that doesn’t keep someone from stealing one of the most precious things in her life - the Avalon Diaries. The thief has sold them to Collin Remington, entrepreneur with a dubious reputation. Unfortunately, by the time she catches up with the businessman, the diaries have been stolen by Lord Cardan who takes them back to the era of the Round Table. Thanks to Merlin, Collin and Molly find themselves whisked back to the sixth century. For Molly it is a return to the years of her young adulthood, while Collin must come to terms with this new way of life. Molly’s real name is Lady Mary Pendragon and she is the daughter of King Arthur and Queen Mildred who unfortunately could not seal their love with marriage. Magic weaves its way through Molly’s life, the magic of the Warrior Witches or Light Bearers of Merlin’s High Order. These Lady Knights are led by Molly. Her return from the future upsets the balance of Arthur’s world and the timeline changes. People die before their time, others are evil when they should be good or good when they should be evil. Molly fights to bring the timeline back to where she knows it should be, but success continuously eludes her. Collin is trying to embrace life in the sixth century, but Molly doesn’t make it easy for him. When I first picked up this book I thought it was going to be another Arthurian legend. Same story told in a different way. I was so wrong. This book takes the original legend and branches out into its own strong tale. Lady Pendragon has magic, adventure, heroism and sword fighting. All good ingredients for an enthralling tale which also contains humor and romance. Elves, giants and many other magical creatures wander through the pages of this book, enriching the story with their own unique magic. I would definitely recommend this book, especially if you like magic and Arthurian legends. And if you don’t like them, read it anyway. You will probably be converted. If this is a sample of Ms. Mathews' work I will certainly be reading other books by her. CTR review for Lady Pendragon! Coffee Time Romance has reviewed my latest release at NCP, Lady Pendragon! Here is a snippet of the review! Ms. Matthews has given the reader a new twist on the Arthurian legends. Arthur and his sisters are just as powerful, but come across as real people. Morganna is not all evil, and Queen Gwen is a silly over religious woman, not Arthur’s true love, but not the backstabbing adultress either. The plot is full of interesting characters both magical and mundane, and the storyline is full of excitement and unexpected twists and turns. The highlight of the story is the love story between Collin and Molly. Once I got past his being the grandson of her best friend in another time, I enjoyed their story immensely. Both strong characters, their story is not smooth, but they complement each other perfectly. I really enjoyed my trip back in time to Camelot, and Ms. Matthews’ take on the legend. Read the full review here! Lady Pendragon Review! Lady Pendragon has released at New Concepts Publishing! Collin Remington was used to getting what he wanted, and he wanted Lady Pendragon. Born in the golden age of Camelot, Molly Pendleton had fought many battles against dark magic. The daughter of King Arthur she was destined to be the best Warrior Witch the world had ever known. When Collin Remington storms into her life in present day New York, she is met with a foe she can never hope to defeat, for Collin wants her as his own, and he’ll stop at nothing to claim her heart. With an ancient evil resurrected Collin and Molly must travel back in time to save the future. Book Video for One Snowy Knight by Deborah MacGillivray! Here is the book video I created for my friend, Deborah MacGillivray's latest release from Kensington Books, One Snowy Knight! This is book three in her Dragons Of Challon Series!